Now that all of the Gatecrash Guild mechanics have been revealed on DailyMTG, we can start to examine them. This isn’t about what’s going to be good in a format, but how they fit into the colors and if they’re just “good” mechanics overall. One note about these mechanics: They’re all very limited. Why is that? Well, much like with the first go around with Ravnica, these mechanics only need to fill up a small amount of space. They aren’t needed to go through an entire block, or even a full set. I would imagine to see them again in Dragon’s Maze, since all 10 Guilds will be represented in the final set of the block. But to wish that these will be extended beyond a printing outside of a Core Set or very limited supplemental products (Think Commander) is foolish. Remember that while these mechanics are part of the identity of the guild, it’s not the full identity. Boros is more than just “better justice through punching”. When you have only one mechanic with so many cards, there are going to be aspects that will be left out. I’m only looking into how the mechanics fit with part of their guild philosophy. Comparing it to Simic’s other mechanic Graft (which also messed around with +1/+1 counters), you can see where this can go. 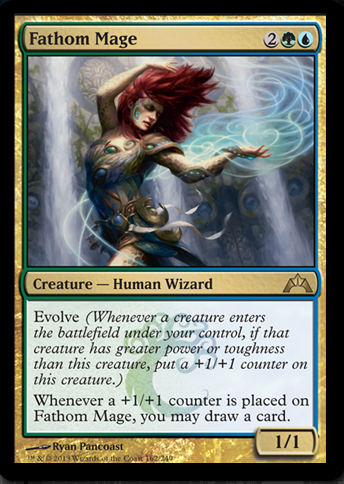 Green will mostly operate around the creatures and getting bigger while Blue is going to be the color that uses the +1/+1 counters for effects. You might see a Green creature that uses the +1/+1 counters for Green things (remove a +1/+1 counter: Fight target creature), but it should be Blue that will be really fun with the +1/+1 counters. Bloodrush – [Cost], Discard CARDNAME: Target attacking creature gets +X/+Y until end of turn, where X is CARDNAME’s power and Y is CARDNAME’s toughness. Alright, so that’s a little awkward, but it makes sense. Basically, you’re discarding the creature in your hand to make an attacking creature bigger by the size of the creature you just discarded. Yes, this is instant speed and yes, it’s uncounterable by normal means (both Green and Red hate Blue, so this is perfect). Does this mean a Stifle-like effect is going to be in Gatecrash? I don’t know. Gruul wants to finish the game ASAP, which is in Red’s (and a dash of Green’s) wheelhouse. If it means not worrying about the future to help the now, Red is all over it. Green, naturally, wants to help creatures, and it’s usually by almost any means necessary. Using a creature to help another creature out is Green’s forte. 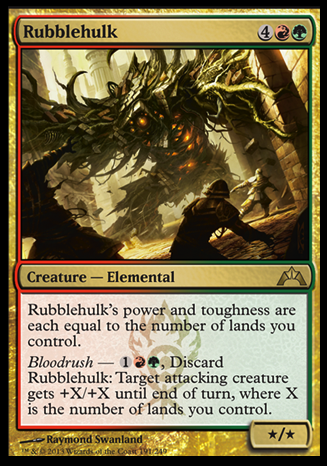 We’ll most likely see several combinations of Red and Green creatures (some with first strike, others with trample) to help with Bloodrush, but the real key is causing havoc with the combat math, something that Gruul loves to do. Battalion – Whenever CARDNAME and at least two other creatures attack, EFFECT. It should be no surprise that the two colors that had Battle Cry also received another attacking combat mechanic. There isn’t much to say about this since both colors are used to this area (First/Double strike, Battle Cry, Bushido). What is interesting is the environment that this mechanic takes place. 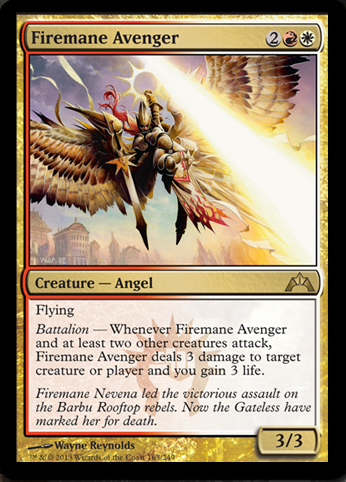 This mechanic suggests that Boros will be the token guild in Gatecrash. It fits in with their flavor (the army feel), but the signs point to this theory. With Simic, you have another “needs more creatures” mechanic, but that’s based on size, not just number. Boros doesn’t care how big the creatures are, it just needs a number of them. And the only way to assure that you get plenty of creatures to attack is to make sure you have more creatures than your opponent; the easiest way is to create them. We saw this with Morbid and enough creature effects dying that it made a difference (though it was a large mechanic, not a small one). As long as the guild can support the keyword with “must attack” and vigilance creatures, you’ll see that smattering of token creation as well. Blackmail is such an ugly word; I prefer extortion, the ‘X’ makes it sound cool. Again, another home run for a mechanic matching its guild. This is also the only mechanic that doesn’t have to rely on creatures for the mechanic to work, which I find interesting. Extort can be found on any permanent, though will most likely only show up on enchantments and creatures. It’s interesting that the mechanic cost is set as [B/W] and a drain of 1, because I would’ve liked to have seen variable costs of both mana and the amount that could be drained. But, if you have enough of them in play, they all trigger and it might be cheaper in the long run to just stick with the fixed cost. This draining mechanic is seen all over in Black, but what part of this is White? While the whole part of the Guild keyword is to portray a part of the guild, this don’t seem very White. In fact, Inquisitor Exarch, Stern Judge and Suture Priest are the only mono-White cards to make an opponent lose life; one of those was in Torment mimicking a Black hoser card and the other two were in a “Black” based set (New Phyrexia). There is some stretching, but White is in it for the long game so it fits just enough to make it plausible. As for the White’s love of the short and long game, that’s a story for another time. Now, the most complex keyword we’ve seen in a while from one of the more complex guilds. 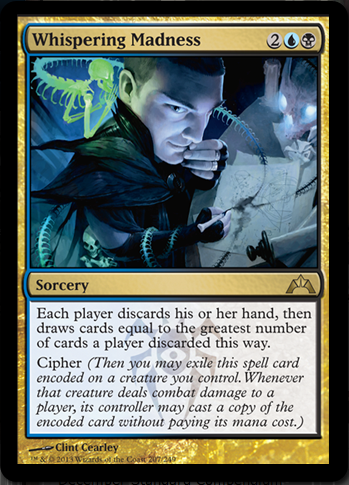 When I first read it, I thought you could just exile the card and “encode” it onto the creature, which made it insanely awesome Sadly, that’s not the case. Cipher is basically a spell that also turns into an aura card. It “encodes” the creature waiting for combat damage to be “cast” again. There’s a hint of Haunt in this mechanic, but it delves into the little used “attach this spell to a permanent” design area. Free spells are always dangerous, so whatever effects are created need to be watched. Besides the unneeded extra verbiage of “encode” with the keyword Cipher, what makes this unique is that this mechanic is fully dependent on creatures when itself can’t be seen on a creature. Sure, it can be cast without having a creature you control, but its usefulness depends on attacking creatures. How can that work in Blue/Black? Maybe if it had some flying, or unblockable, or swampwalk, or intimidate creatures in its arsenal, then it could connect against an opponent. Much like with Prowl way back in Morningtide, you need to be sneaky to make this work. Huh, that sounds very Blue/Black to me. In all, we have five different mechanics, which is important when you’re trying to portray five different guilds. The argument that I’ve seen is that Bloodrush is too much like Channel and Battalion is pretty similar to Battle Cry can almost make sense when you’re talking about areas of design. You can certainly narrow in a focus on a particular aspect of a mechanic when you are looking for something much smaller than trying to carry a whole block (or even a whole set). Will every time that a mechanic focuses on your life total, will people complain that it’s “basically Fateful Hour”? Why should you cut off a ton of design space only because something less focused has already been designed. Most of your favorite mechanics are a variant of Kicker, Flashback, or Cycling. By denying that aspect, it could easily strap the innovation of design. Again, I don’t know which one will see the most play in any format because it’s not just the mechanic that matters, it’s how powerful it is. You can push almost anything if it’s cheap or game changing enough. Two of the mechanics excite me as a deck builder: Evolve because that’s my Johnny side speaking out, and Extort, because that’s my Spike side having fun. If I were to guess which one of these I would see in a future Core Set, Battalion seems like the safest bet (though Evolve might be just simple enough to make it as well). None of these seem bad, but until we play with them, it’s all hypothetical at the moment (Evolve might be too swingy, Extort could lead to too long of games, Battalion might not trigger enough times). I’m not disappointed by any of these mechanics, just not floored with excitement. 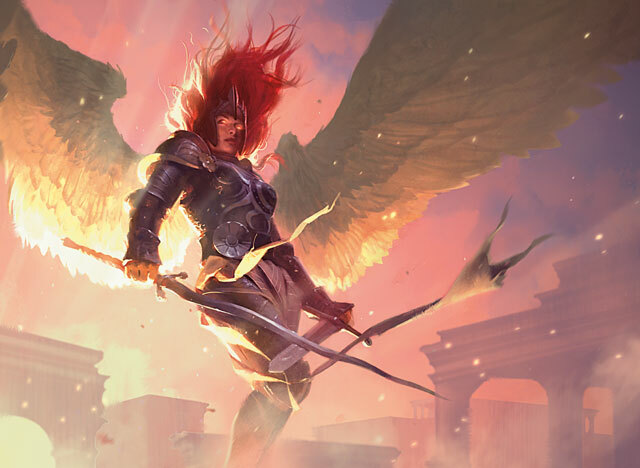 I wonder if Odric will finally see some play with that Battalion mechanic in Boros decks. I think the white part of the Orzhov is supposed to be the life gain, but you are right, the mechanic seems very black in nature. 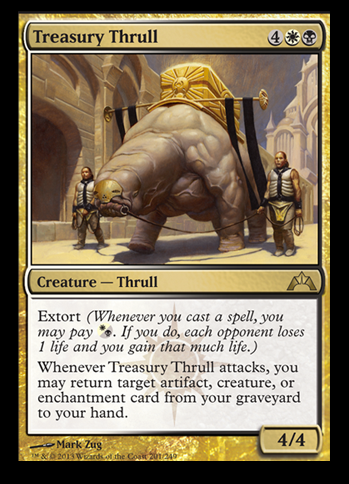 I’m very interested to see how extort plays out competitively because it may seem weak at first, but if it is on enough cheap cards, that could compound quickly. like enchanting a creature, the card is actually exiled, so about the only way to remove that card is to remove the creature its is attached to.